Whew, last week blew by! I had planned to post this recipe last week but somehow between getting ready to go back to work, getting back to work and still trying to exercise, there was very little time to blog. I have some free time today so I’m trying to catch up, plus Cooper fell asleep while in the Beco, so I can’t do much else right now. Getting back to work has been ok. I had a really good day on Wednesday and it felt great that my coworkers were so happy/relived to see me and I was glad for some adult conversation. Thursday was an entirely different story…it was like I never left and the same issues I left, were still there. BOO. Not how I was hoping my first couple days back would be. We’re still enjoying all the summer vegetables but summer is slowing coming to and end. Madeline starts kindergarten in 2 weeks! This recipe was able to utilize a ton of the veggies I received from our CSA as well as a great option for a meatless meal. I served it with a green salad on the side for dinner and had the leftovers for lunch. I love the roasted vegetables and it was so filling with the addition of the black beans. Preheat oven to 400 degrees. On a large baking sheet lined with parchment paper, toss the pepper, zucchini, squash and onion with olive oil. Season with salt and pepper. Roast vegetables for 30 to 40 minutes or until tender. Stir occasionally. Once roasted, let the vegetables cool to room temperature. Reduce the oven heat to 350 degrees. Grease an 8×8 baking pan and set aside. In a medium bowl, combine the roasted vegetables, black beans, seasonings and jalapeno. Season with salt and pepper. In the bottom of the pan, spread 1/4 cup of the enchilada sauce. Make a layer with the tortillas to cover the pan bottom. Top with 1/3 of the vegetable mixture and then 1/3 of the cheese. Make a second layer with of tortillas, enchilada sauce, vegetable mixture and cheese. 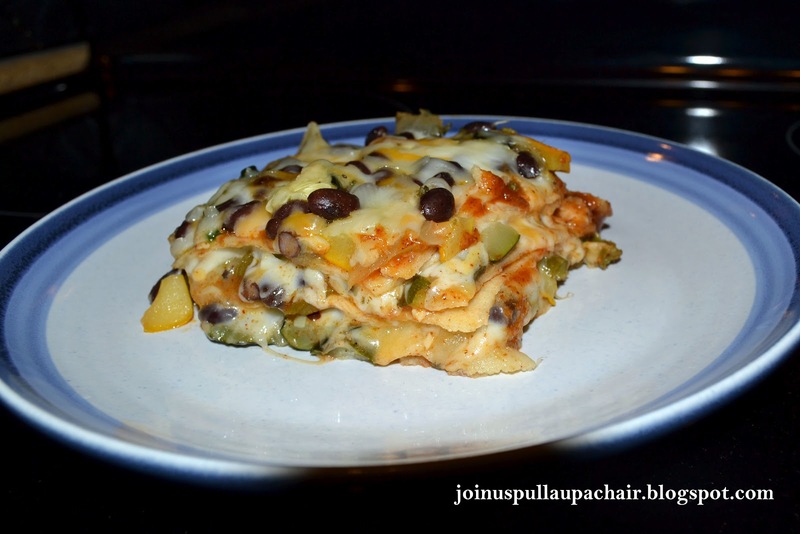 Top with a third layer of tortillas, sauce, vegetables and cheese. Spray a piece of aluminum foil with cooking spray and cover the pan. Bake the enchiladas for 20 minutes. Remove the foil and bake for another 10 minutes or until the cheese is melted. Let the enchiladas cool for 10 to 15 minutes before cutting into squares.